Machu Picchu as seen by the former World Champion of Mountain Bike Trials, and his faithful companion (and photographer) Bob Allen. For three and a half hours I hiked in a trance-like state with my bike on my back, with every step I cursed its weight and questioned the wisdom of bringing it on this trip. I labored over a steep, switchbacking trail that serpentined up a deep jungled valley toward a 13,500 foot gap in the mountains called Dead Woman Pass. I stumbled over slippery rocks and roots in a section of cloud forest, where moss hung heavily from the white-barked alisos trees, bamboo sprouted toward the sky and giant ferns carpeted the moist ground. I sweated my way above the treeline into an alpine zone where the sparse vegetation clung tenaciously to the ground and my steps came slower as my body searched for oxygen. I soon grew weary and bored from this endless hike-a-bike and set my mind on the glorious downhill I envisioned on the other side. 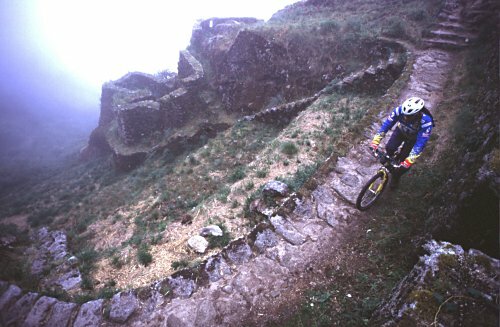 As I neared the pass, I tried to recall my conversation with Hans Rey where he had made it sound fun to ‘ride’ this old section of Inca Trail in the heart of the Peruvian Andes. Rey, a bicycle trials rider by profession, spends a good portion of his year traveling around the globe ‘riding’ his bike over the unimaginable. During a recent promotional show tour through Southern Peru for GT Bicycles, he combined his fascination for ancient civilizations with his penchant for pushing his competition-honed skills in unlikely, if not exotic, locations. “I am always looking to conquer natural and man-made elements in a way that is technically and visually exciting,” said the 30 year old Swiss-German (now a Laguna Beach resident), about his view that the whole planet is one big trials obstacle. This adventure started the previous day in Cuzco, the former capital of the Inca Empire, now a city of 250,000 people. The streets are lined with Spanish architecture built around and upon Inca foundations, and are filled with buzzing Indian markets and tourists, who use this mountain city, with an elevation of 10,000 feet above sea level, as a gateway for trekking, whitewater and jungle adventures in the Andes. Here we met our guide, Luis Olivera, and were also joined by Hans’ wife Marisa, who had flown in for this leg of the trip. We left Cuzco in a rented bus at sunrise, and for three hours we bounced down the Urubamba River valley on a road that became increasingly rough and narrow. In the village of Ollentaytambo, we picked up our hired Quechuan Indian cook and porters who would be carrying our gear that didn’t fit into our day packs. When they entered the bus and saw our bikes, expressions of disbelief, then amusement, crossed their weathered faces. I knew that their response was an indication of the trail to come. For another 20 kilometers we rumbled past dusty adobe villages, corn fields being worked by hand, and mountainsides which disappeared into the clouds. We stopped at kilometer 88, where we chose to cross the river on a recently repaired cable car rather than continue down the valley to the next bridge. We unloaded the bus and the porters divided and packed the gear. Pablo, a short man with powerful legs and a toothy smile, wrapped my backpack in a worn burlap sheet and carried it slung across his shoulders with the material knotted in front of his chest. 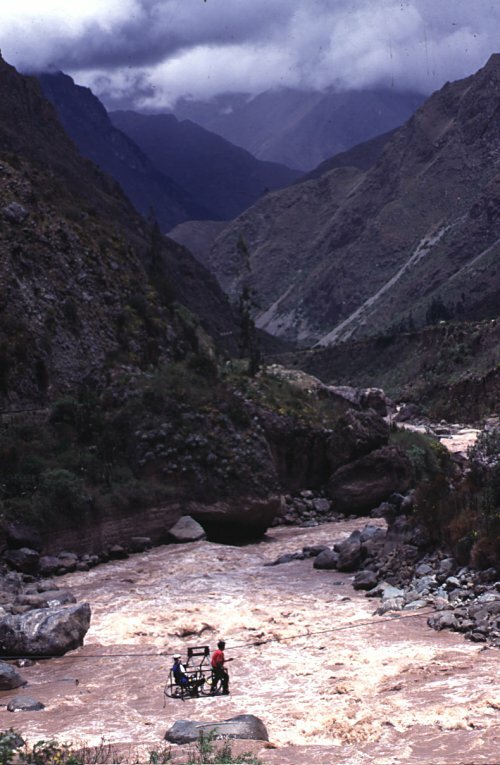 Our group rode across the Urubamba River two at a time on the rickety cable car to join the Inca Trail on the other side. I was halfway across the river before I noticed that one of the two pulley wheels holding the car onto the cable was missing. I said a little prayer for the rusty, worn bolt holding on the remaining wheel and tried to ignore the roaring whitewater thirty feet below me. After safely joining the others on the opposite bank, Hans and I set off on our bikes while Marisa, Luis and the porters wisely chose to hike. A hardpacked dirt trail led us above the river through a constantly changing landscape of hard scrub plants and cacti, granite scree fields, semitropical forests and herds of goats. Along the way, Indian families sold Sprite or Coca-Cola from their thatched huts while chickens scurried around us in search of food. At the large terraced ruins of Llactapata, we turned away from the river and, under a gentle rain, rode up a deep canyon. 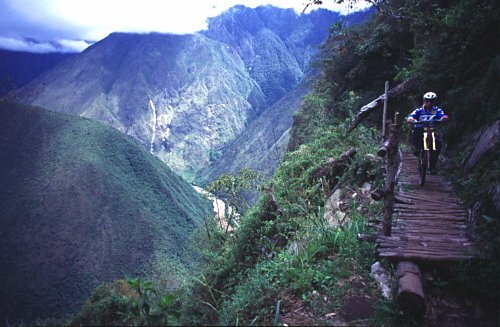 This portion of trail to Machu Picchu is a detour from the 15,000 mile highway system which the Inca built across the Andes from their capital in Cuzco. In the late 15th century their Empire stretched from what is now Columbia in the north to Chile in the south. Late in the afternoon, we stopped for the night and set up camp near Wayllabamba, a tiny village at a junction of two canyons. After a brief siesta, I crawled out of the tent to find a half-dozen kids sitting on their haunches examining our bikes in the fading light. A braver one, dirty-faced and smiling mischievously, gingerly poked at the rear wheel with a stick while the others giggled as the turning freewheel clicked. 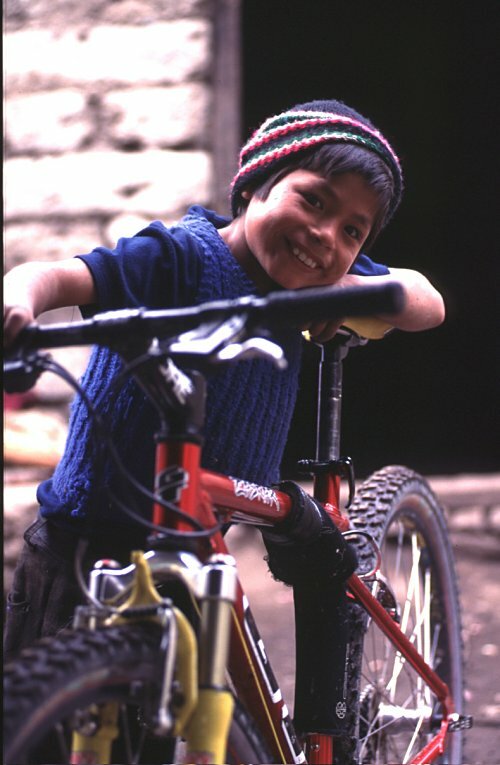 Here in this remote village tucked 10,000 feet up into the Andes, I wondered if their playful, wide eyes had seen bicycles before, and I doubted that they had witnessed anyone ride one like Hans Rey. Hans gave a short trials performance which seemed to break down the language and cultural barriers and left everyone smiling. Word quickly spread throughout the village and soon the entire population watched in amazement as Hans hopped, jumped and wheelied around camp. The children clapped for more until Hans chased them and they scattered with squeals of delight. Lightning, thunder, and a steady rain came that night, filling my dreams with the signs of water. At dawn the voice of our cook Cosme woke me as he brought the coca tea to the tent. I wriggled around in my sleeping bag, stretching out sore muscles before I sat up to stir the sugar into the steaming, bitter brew which is said to offset the effects of altitude. Looking out of the tent I saw that the heavy rain clouds had lifted, leaving a boiling mist in its place, obscuring the peaks I sensed were above us. It was November, the beginning of the rainy season in the Andes, and this weather was to be expected. After a breakfast in the cook tent, Hans, Marisa and I took to the trail. Our immediate goal was to get over the 13,500 foot Dead Woman’s pass, nearly 4,000 feet above our campsite. The pass is named for the rock outcropping that resembles the profile of a well-endowed woman. I searched for this curvaceous figure but the clouds kept her veiled from my view. When Hans and Marisa arrived at the top, we paused in the moist breeze long enough for lunch and to add more clothing before rolling over the edge to the much awaited downhill. Within a dozen yards of the top, my fantasized descent vanished when the trail turned into the nastiest stone staircase imaginable. Unlike the relatively steady traversing climb we had endured on the other side, this part of the Inca built trail dove directly down the steep canyon. This section of trail had recently been restored and the granite steps bore the roughness of its youth. 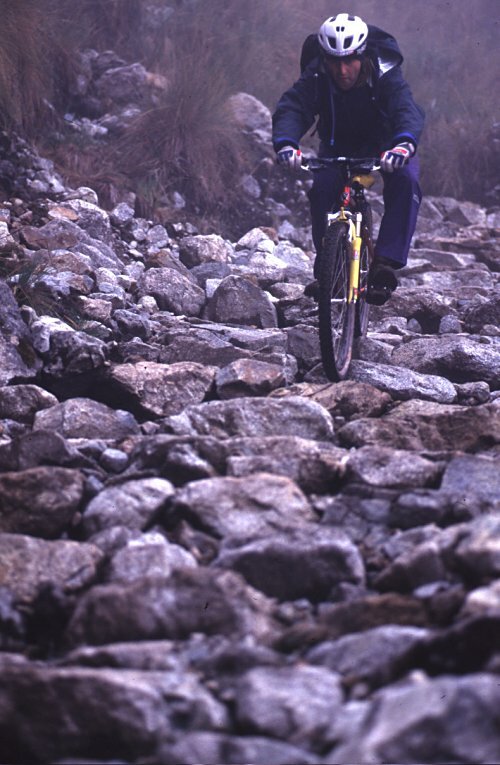 As I started hiking down, Hans lowered his saddle and began picking his way through the jagged blocks; hop by hop, step by step, he slowly and deliberately worked his way down the “stairs.” Every hand cut and placed piece of rock represented a different technical challenge. After negotiating the first long section of trail, Hans stopped, shook out his hands, squinted at me, and exclaimed in his German accented English, “Dude, this is so gnarly.” We continued to descend for two more hours to the place where we would make our next camp. The evening was spent exploring nearby ruins, eating an early supper and falling into a deep sleep shortly after darkness. The night’s clear skies were quickly hidden by clouds at sunrise. Our plan for this day was to make it to Machu Picchu before sunset, with the optimistic hopes of photographing in the afternoon’s sweet light. While it was only 30 km to the ancient city, two more 13,000 foot passes lie between us and our goal; and if they were anything like the first, it was going to be a long day. We began the climb from the edge of camp and took a direct line toward the sky. I settled into my hike-a-bike mentality and thought about the Incas who built this grand traverse across the mountains, the physical effort involved in its construction and the loads of gold they carried across it. These thoughts momentarily made my bike and camera gear seem lighter. To my dismay, the backside of the second pass was nearly as inhospitable as the the first. I hiked as Hans performed his magic over the unforgiving terrain. The rest of the morning became a blur of technical drops, eerie sections of cloud forest, log bridges, short tunnels through solid rock and crumbling ruins. There were even sections that I dared to ride – albeit some were as short as a few hundred yards, but in comparison to carrying my bike, it seemed like miles. On the back side of the third pass, some 3,000 stone steps were constructed to form a path from the clouds toward the valley below. As we descended, the fog billowed up the canyons in alternating bursts of clarity and complete whiteout. In a moment of clearing, we found ourselves suddenly surrounded by the Phuyupatamarca ruins, the most extensive and elaborate we had seen thus far. The Incas had built this terraced community on an impossibly steep hillside which told of their craftsmanship and determination. As we neared Machu Picchu, the landscape became more dramatic and the ruins larger and more complex, which added to our excitement and anticipation. At a scenic overlook of the Urubamba River, we found our porters waiting for us. The difficult nature of the trail allowed these sandal-shod trekkers to be faster than our photo-shooting bicycle pace. After drinking in the sights, Hans started the downhill toward our lunch spot with the porters in hot pursuit. I dropped in last to follow this rag-tag singletrack paceline. A competitive camaraderie had formed between us and the porters, who still thought we were crazy for bringing bikes on this trail. This descent quickly turned into a friendly race where the porters ran with their heavy packs, using their knowledge of the terrain to take short cuts, while Hans relied on his skills to negotiate the steep, rutted trail. Hans was leading this informal race until he missed a turn and stuffed himself into the bushes, which allowed Luis to sprint past for the victory. I arrived to find everyone breathing hard and laughing. During lunch we noticed that dark clouds were rising above the peak also named Machu Picchu, which now stood as the only barrier between us and the ancient city. Luis was predicting an afternoon storm as we set off on the trail constructed around the sheer backside of the mountain. 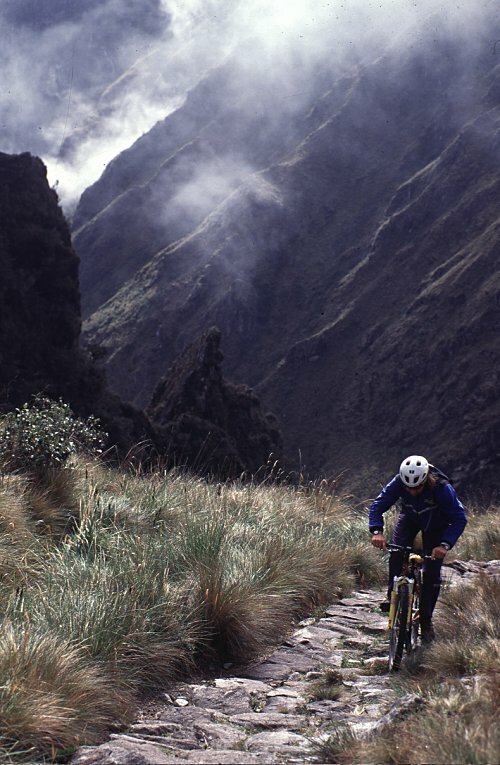 We rode along the hand-built ledges suspended halfway between the sky and the roaring Urubamba below. There was no room for errors as some sections had 1,000 foot vertical drops just inches from where our tires passed. Arriving at a staircase so steep that we had to climb with both our hands and feet, we ascended with the bikes on our backs to a stone temple called the Gate of the Sun, the first point from which the sacred city of Machu Picchu was visible. As we stood spellbound by the power of the scenery, blue sky replaced the clouds and sunshine bathed the valley in a golden light. We started the final descent of the journey, pausing frequently to photograph and just marvel at the spectacular landscape. When I finally ran out of film, I put the camera away and lost myself in the energy and atmosphere of this ancient place. From my perspective on a warm rock in the afternoon sun, I viewed the terraced fields which grew the crops the Incas needed and the orderly construction of the city that spoke of community, cooperation and a connectedness to the land and sky. The Inca Empire rose in these Andes, developed a vision that embraced the sun and mountains, built cities and temples in that vision, and then vanished. The ruins are the only information these ancient people left us. There is no written or oral history to tell us how and why Machu Picchu and other cities were built and then seemingly abandoned. The hours passed quickly the following day as we explored the intricate stone work of the houses and temples where every turn revealed another secret and a glimpse of the people who celebrated life here. What the Incas left behind is a monument that speaks of human ingenuity, the fruits of extreme physical labor and their belief in the spirit of the earth and sun. That afternoon we caught the slow, narrow gauge train back to Cuzco and I rode with my face pressed against the dirty glass searching among the towering peaks for signs of the trail that the Incas had hidden in the sky. As I relived the events of the previous three days in my mind, I reluctantly had to agree with the decision to close this portion of the Inca Trail to bikes. Between the extremely demanding technical terrain and sections which we felt were inappropriate to ride out of respect for the ancient ones, Hans figures that he only rode 50 percent of the trail, and I even less than that. I considered the fact that I might have enjoyed the trail more by leaving my bike behind, but the twisted cyclist in me had enjoyed sweating my bike up and down these mountains. I had pushed my technical skills to my limits, really scared myself a couple times, and got to watch one of the world’s best bike handlers tackle the most technical trail he has yet to ride. While I will remember this journey for the power and magic that this surreal land exudes, it will certainly stand out as the most amazing hike I’ve ever taken my bike on.